Home » Coast to coast » Build workers’ assemblies! 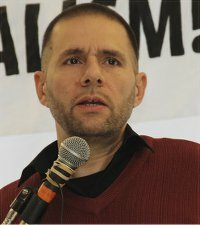 Talk given by Steven Ceci at the 2014 National Conference of Workers World Party in New York City. First, I would like to congratulate Comrade Tommy for his courageous decision as a McDonald’s worker to go on strike and be arrested. We also want to salute the Walmart workers who, this past Thursday, took the daring step of conducting a sit-down strike in the middle of their respective stores. Following their strikes, hundreds faced squadrons of police and were arrested. Anyone familiar with the power of the Walmart empire, whose wealth rivals that of entire countries, understands the courage necessary on the part of these workers to take this kind of action. We as revolutionary socialists could not be happier! The emerging low-wage workers’ movement represents the future of the working class. In fact, the term “low-wage workers’ movement” is a slight misnomer, since the majority of the working class has been pushed into poverty as the global capitalist system intensifies its exploitation and grows more moribund with each passing day. I want to talk about the power of workers’ assemblies as vehicles for the working class. As many of you know, we played a pivotal role in forming the Baltimore “We Deserve Better” Workers’ Assembly, inspired by our sisters and brothers in the Southern Workers’ Assembly and, of course, by the international movement. Our workers’ assembly grew organically out of the Baltimore Peoples’ Power Assembly. Both function in a complementary way with each other. And now Los Angeles has launched a Workers’ Assembly. One of the major features of capitalism in this period is its global character and the fact that it has atomized workers in a million different workplaces, making it harder for workers to organize. 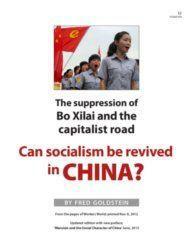 The global system of capitalism has more and more forced workers to compete with each other. To succeed in even the smallest fight, it is necessary to fight as an entire class; in fact, it is necessary to fight against capitalism itself, if we are to seriously take on the life-and-death issues facing workers. How can the fast food workers succeed without the full, active engagement of the entire working class? The workers’ assemblies can afford workers the tool to do this. They are not a substitute for unions — in fact, the assemblies must vigorously defend the unions — but rather a necessary complementary form of organization to bring union workers, the unemployed and the vast majority of younger and unorganized workers together on a higher and more defined level. And what about Ferguson, police terror and rampant racism? Aren’t racism and police terror workers’ issues! What about the huge number of unemployed workers, particularly the youth who have no future under capitalism? How about the migrant workers and their families? These are all workers’ issues, which the assembly must and can take on, along with the many day-to-day issues that the working class and the community face, from foreclosures to water shutoffs. As the capitalist crisis deepens and ultimately convulses, the organization of assemblies, from workers’ to people’s assemblies, must be prepared to take on the issue of political power itself. Imagine for a moment if the whole working class in Los Angeles was organized into powerful assemblies. When the Walmart workers held their courageous sit-down strike, the workers in the assemblies would have joined them, surrounded Walmart and defended these workers. That would have been workers’ power, the kind that the Walton family could not ignore. We look forward to the day when that will happen — maybe much sooner than we think. Power to the workers! Power to the people! We salute the low-wage workers! Build workers’ assemblies!